virtualpolitik: If Life Gives You Tomatoes . 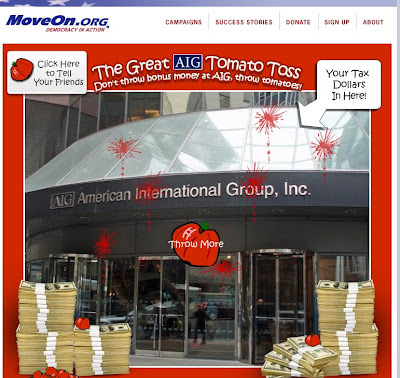 . .
Moveon.org has been encouraging its adherents to take part in The Great AIG Tomato Toss, where they can lob virtual versions of a splattery fruit and/or vegetable at the portals of the corporate insurance giant that has received multiple bail-outs from the taxpayers. Much like the many shoe-throwing online games that appeared after the shoes were hurled at George W. Bush by an enraged Iraqi journalist, this game encourages political opponents to vent their outrage harmlessly. I've written about the forms of political satire sanctioned by what I call the Internet's "theatres of cruelty" in the Virtualpolitik book. Such an ineffectual form of political resistance may give citizens some of the satisfactions of pseudo-interactivity, but without even a virtual inbox these games seem to have little hope of influencing policy.